In recent years, mobile number has become an important factor for authentication and hence more and more enterprises employ methods to capture their users' mobile numbers using SMS. This is a typical scenario which most of well known IT companies (such as Google, Facebook and others) use to authorize their users. Server generates a token and shows that token to the user in the same UI and asks the user to send it to a specified number (Server Messaging Centre Number = SMCN) using the mobile number that is entered by the user. Both are equally good in terms of security. According to me the first senerio is good enough and adapted one. We are used to first senerio. The second senerio doesn't making much changes and unnecessarily user will confused with the new approch to do things. In terms of UX, the first senerio is much easy and user know this gonna happen. Most of the Indian User don't know the SMCN, they have to search for it, this will also create frustration to the user. In first senerio now user don't have to switch between app and SMS launcher. If he receives any token sms, the notification for SMS on mobile, have code shown in alert only, they just have to remember for atleast 30 seconds. 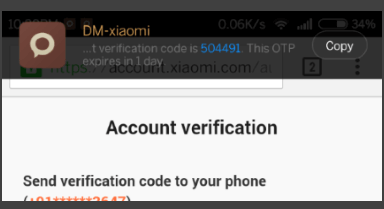 See the picture above, Now MIUI allows user to just copy the Token from Alert banner [No Need to Switch between Apps]. You can see the mobile manufacturers also adapted to the first senerio and making changes to their UI accordingly. I have to be honest and say I have never liked the idea of verifying mobile phones as a security measure. More places are starting to use this as their sole verification method, which causes major problems for people without mobile phones as there is no way for them to create accounts with some of these providers. I do, however, think it is a perfectly valid 'option' for people who are happy to do it this way, just that it shouldn't be the only option available. Anyway, getting back to your question and the two approaches you're seeking feedback on. Originally I thought they'd both be essentially the same in terms of security, however others here have pointed out that there are problems with the second approach. From a user experience perspective, I think they're both the same in terms of how clunky they are. So, you don't want to step away from this unless you have something that is significantly better and therefore warrants the change. All that said, I'd like to offer an answer to your main question title: "What is the best mobile number authorization strategy?". The UI instructs the user they are about to receive an automated phone call and to follow the prompts when they do. The user receives the phone call and the system states something like "Were you expecting this call from Apple - press 1 for yes, 2 for no". If yes, the IVR then requests that the user confirms this again by either speaking or entering the last six digits of the mobile number they entered earlier in the UI. It then confirms the validation and hangs up. If no, the IVR says something like "Thank you. We apologise for any inconvenience". The original UI refreshes and confirms validation and that the mobile number is now authenticated for the user (unless, of course, the user opted for 'no' they weren't expecting the call). End of story. Secure, simple, fast. And it offers a much better experience for the user! This approach is a better option because users already know the six digits, so it's not something they have to 'remember' or switch between screens to access, and the server still does the security/authentication check to confirm the details (i.e. it still verifies the user has access to the mobile number they entered). The server generates a random 'easy to remember' word (e.g. "Superman", "Elephant", etc) and shows this to the user, instructing them that they are about to receive an automated phone call and to follow the prompts when they do. The user receives the phone call and the system states something like "Were you expecting this call from Google - answer yes or no". If yes, the IVR then requests that the user speaks the random easy to remember word previously provided to them. It then confirms the validation and hangs up. If no, the IVR says something like "Thank you. We apologise for any inconvenience". If these risks were not an issue, I'd probably prefer the second approach. But either approach is to my mind a much simpler process that takes less than half the previous steps and offers a much better experience for users. Another option, if the original user interface was a mobile app, is to fast track Step 1 by automatically acquiring the user's mobile number from their device (if it's a mobile phone). However, I do think you would still need Step 1 in that it would be asking the user to confirm if this was the number they wanted to use. Anyway this is my take on the best mobile number authorization strategy. I just wanted to say I really like the 4 step approach that Monomeeth suggests. I'm a huge fan of the KISS principle and this approach seems to fit. The only negative of it that I can see is if you're laying in bed in the middle of the night next to your partner and you got a phone call, it may not go down too well, so the UI would need to let users know prior to them providing their number what the process was going to be, so they can decide at that point whether now was the best time to verify their mobile number or whether they should wait. Otherwise though 4 simple steps would be much preferred to the 11 steps outlined in the question. I'm surprised that nobody has pointed out that this is wide open to a spoofing attack. Sending an SMS with a spoofed originator (the sender) is incredibly easy and costs very little to do. You can't trust that the message has come from the genuine owner of the number (or even that the number exists at all). Two-way verification cycles can be embedded to sign-up process. SMS for an individual can cost money. If you make your user to pay for your SMS; they can feel that as another barrier. SMS is not the only way; automated phone communication is also used for completing these verification cycles. User will not want to pay for such basic patterns. SMS Sender number/text is not secure! 2)As @Abhishek Sharma points above, that the alert is a great way to remember the token and add it. Most of us rely on that. Sometime time back I had written a post about PAYTM doing the OTP message wrongly, so as to put the token value deep in the message rather than in the first opening line, which makes it easy to view in a top bar alert. Article here: https://pregnantwithideas.wordpress.com/2015/08/07/paytm-com-user-experience-review/. Paytm changed this behavior post the same. In terms of security, both will be pretty similar. Unless of course, it costs extra to send the text message to the specified number, and it is part of the earnings plan. I think overall option 1 is more user friendly. Also -this has been stated before-, when working on a mobile device, usually the incoming text message is briefly displayed while being in any app. That means a user might not even have to move out of the current app and can just type in the recieved security key immediately. This makes option 1 the faster option as well as the cheapest (for the user). Not the answer you're looking for? Browse other questions tagged security authentication smartphone user-journey sms or ask your own question. How to display SMS conversations effectively in website?